On February 2nd 1653 New Amsterdam received municipal rights thus becoming a city. We at present affectionately refer to it as New York. The original span (acquired by a wily Dutchman, Peter Minuit) was only a section of Lower Manhattan, but has throughout its tumultuous past been known as Fort Amsterdam, New Orange, Capitol City, Gotham and of course the Big Apple. 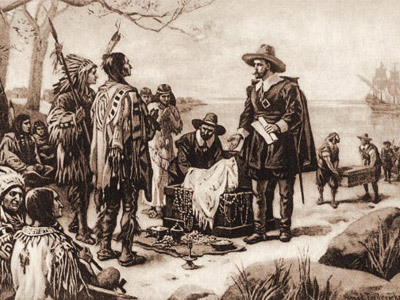 During May 24th 1626 in order to legally safeguard the settlers’ investments, possessions and farms on Manhattan island, Minuit negotiated the “purchase” of Manhattan from the Lenape band of Manahatta Indians for 60 Dutch guilders worth of trade goods, which equates to just over $1000 today. Another popular version in this story of Manhattan claims that Minuit actually purchased the island from the wrong tribe (the Canarsee actually living in Brooklyn) while the true local people, the Weckquaesgeeks, were excluded from the transaction. This transaction is often viewed as beneficial only for the Dutch (the trading benefits were great for both parties) however it was not viewed this way at the time. This was the first legal change of name and possession for New York. When originally settled in 1624 the area was claimed as a Dutch colony (New Netherlands). To ensure its survival a fort was built to house the new inhabitants and protect them from harsh conditions and the Mohawk wars in the north. This fortified town at the south end of Manhattan became New Amsterdam. Ceded by the Dutch Director General Peter Stuyvesant in 1664 to British warships it was renamed in June of 1665 in honor of the Duke of York and Albany. The Dutch brokered a deal with the English that sought to guarantee New Netherlanders liberties, including religious freedom along with the nutmeg negotiation. In 1667 when peace was brokered in the Treaty of Breda the Dutch were granted the tiny spice island of Run in the Banda islands, rich in nutmeg (and consequently mace) as long as they did not press their claim to New York. A great deal for the British until you realize the wily Dutch once more obtained millions in the highly prized nutmeg. In July 1673 the Dutch occupied the city and renamed it New Orange, but by November 1674 it was back to New York. Ironically the Duke it was named after, reigning as James II of England would cede his crown and country to the Prince of Orange within 25 years and broker no deal in return. New York was the U.S capital under the Articles of Confederation (1785 to 1788) and remained the first U.S capital under the Constitution until 1790. It was an obvious choice due to its proximity to Europe, its naturally deep harbor and defenses started by the Dutch and re-enforced by the English. Again, New York changed hands but not name. Gotham derives from an article by Washington Irvine (in 1807) that lampoons New York culture and politics as being base and uncouth. Gat (Goat) ham (Home) is a place in Nottinghamshire England, which means homestead where goats are kept (in Middle English). Manhattan named after the Manahatta Indian bands (Lenape & Canarsee) who had inhabited this land prior to the arrival of Europeans. Brooklyn named after a Dutch town called “Breukelen”. The Dutch people established the city in 1634. The Bronx named after Jonas Bronck, a farmer, brokered a treaty in 1642 with the Weckquaesgeek Indians. Queens named for Catherine of Braganza, the Queen of England (Charles II wife). Staten Island or states island (Staaten Eylandt) was named in honor of the Dutch parliament known as the Staten General in 1609 by the ironically English explorer Henry Hudson sailing for the Dutch. In 1898, New York (Manhattan), Brooklyn, The Bronx, Queens and Staten Island all merged together forming Greater New York, which is the total area of the city we know today. New York’s most famous nickname is the Big Apple. Several theories abound, so you can decide which suits the cities profile best on this one, if any. It was first popularized in the 1920s by a New York Morning Telegraph sports writer by the name of John J Fitzgerald. He references it but does not give its origins. The Big Apple was referred to (by a disgruntled Kansas City representative) as a city that received a disproportionate percentage of the national sap (regarding government funding). In the early 19th century a Quaker nurseryman Jonathan Jessop (also Jessup) developed a variety of apple on his springwood farm near York, Pennsylvania. Although lopsided it was tart and sweet with resilience for freshness and tasted better over time, a bit like the city itself. Claimed by all and owned by none the myths surrounding the city that never sleeps are as varied and enigmatic as the inhabitants of the boroughs themselves. Throughout its existence in any name it has been both reviled and attracted by the rich and poor alike, it accepts everything and everyone. Still, it is ingrained in the heart of history by all as NEW YORK.